Jody Littleton of Champaign has found a way to remember her late grandmother every day as well as display a collection of jewelry she received from her grandmother. 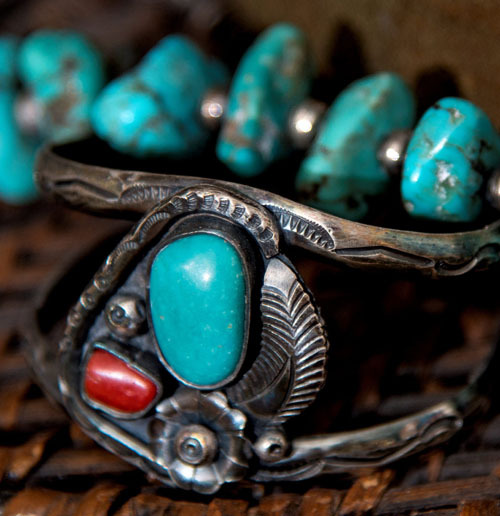 Littleton’s grandmother, Josephine Tewel, collected turquoise and silver jewelry. She wore much of it, but toward the end of her life she passed on the collection to Littleton. While she wasn’t thinking she would wear much of the jewelry, Littleton wanted to do something with it other than put it in a drawer. She decided to display it in her home. She framed two large squash blossom necklaces in shadow boxes and hung them on the wall. 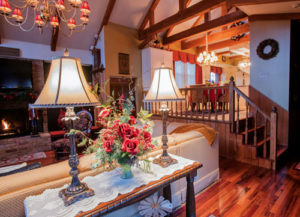 For a while, she had many other pieces displayed on her fireplace mantel. But then Littleton got a corner display rack and now has the jewelry on it. Some pieces sit atop or are draped around pottery. Last fall, a pair of clip earrings hung from the stems of small pumpkins. Tewel and her husband were farmers in the Mattoon area. They didn’t travel much, Littleton said, but they took a trip to Arizona in the early 1970s. “She absolutely fell in love with Arizona and the culture,” Littleton said of her grandmother. Tewel especially loved the turquoise and silver jewelry made by Native American craftsmen. Turquoise was one of Tewel’s favorite colors, Littleton said. She nearly always wore some shade of turquoise or blue, along with pink. She even drove a turquoise Dodge car in the ’70s. Tewel became friends with a woman who ran a pawnshop in Arizona, and the woman would send Tewel catalogs periodically. Tewel would buy pieces of jewelry from her. Several are signed on the back by the artist. Her collection included the squash blossom necklaces, which she never wore. “She just liked them and thought they were pretty,” Littleton said. But Tewel wore many smaller necklaces and bracelets. Littleton remembers her grandmother as a tiny woman wearing large pieces of jewelry. The bracelets were enormous on Tewel’s small wrist, and she eventually had one piece converted from a bracelet into a necklace that she wore often. Littleton wears a couple of smaller necklaces and some bracelets. A bracelet with a floral shape is her favorite piece. Having the jewelry collection displayed reminds Littleton to wear the various pieces. It also reminds her of her grandmother. 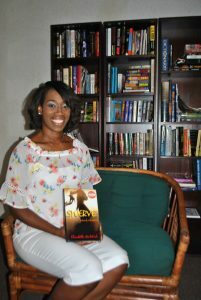 Local author Claudette McIntosh has a true story of survival.